Section 87A was introduced in Budget 2013 and it provides marginal relief to small tax payers. In this post we provide details about the eligibility, the benefits and how it has changed since it was first introduced. The tax rebate under section 87A is only available to resident individuals with net taxable income below certain threshold which keeps on changing year on year Budgets. We would list the limits as was proposed for each year. Also HUFs or NRIs are not eligible for this tax rebate. Applicable from FY 2019-20 onwards. 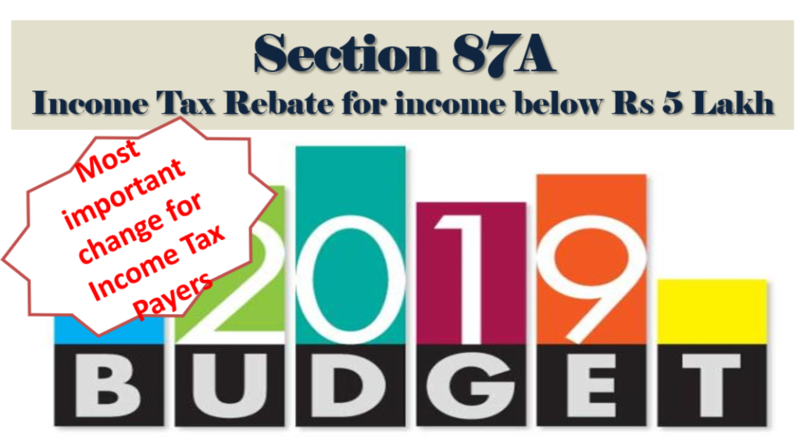 Budget 2019 changed the limit for 87A eligibility. Taxpayers with net taxable income of less than Rs 5 lakhs can claim tax rebate of up to Rs 12,500 under this section. Budget 2017 changed the limit for 87A eligibility. Taxpayers with net taxable income of less than Rs 3.5 lakhs can claim tax rebate of up to Rs 2,500 under this section. This was done as the tax rates had been reduced from 10% to 5% for income between Rs 2.5 to 5 lakhs. There has been no change in this section in Budget 2018 and hence this limit continues for FY 2018-19 (AY 2019-20). The tax rebate under Section 87A has been increased from Rs 2,000 to Rs 5,000 for people with net table income of less than Rs 5 Lakh. Section 87A was introduced in Budget 2013. According to this Taxpayers with taxable income of less than Rs 5 lakhs can claim tax rebate of up to Rs 2,000 under this section. Also Read: 15 Investments to Save Tax u/s 80C – Which is the Best? 80C – Investment in Life Insurance, ELSS, Tax Saving Fixed Deposit, EPF/ VPF Contribution, PPF, NSC, Housing Loan Principal Repayment, Tuition Fee for your children, etc. 80CCD – Contribution made by Central government Employees in his pension account to the extent of 10% of his salary. 80D – Medical Insurance Premium for self and family members. 80DD – Deduction in respect of maintenance including medical treatment of dependent who is a person with disability. 80DDB – Deduction for expenditure actually incurred on self or dependent relative for medical treatment of specified disease or ailment. 80G – Deduction for donation to certain charitable funds, charitable institutions, etc. 80GG – For paying rent in case you do not receive HRA. 80U – Deduction to an individual who suffers from physical disability. If you have a gross income of Rs 7.5 Lakh and invest 2 Lakh in 80C/80CCD(1B) exemption. Also you pay Rs. 50,000 for education Loan interest exemption under sec 80E. Your taxable income comes to Rs 5 lakhs. So you would be eligible for Rs. 12,500 Tax Rebate under Sec 87A from FY 2019-20. The tax benefit on home loan interest can only be claimed after the possession of the house. In your case as possession would happen in next financial year, you can claim interest paid benefit from next financial year. however the Rs 2 lakh that is paid this year has to be divided in 5 equal parts and claimed each year.